Different plants in different forms and sizes created a more creative and artistic zones in the exterior of our house. With that we tend to hire a professional landscape artist to maintain the beauty of our garden. Indeed garden enhances the ambiance of our outdoor areas that is one of the best place in the house where we can unwind and free from stress in our busy work place. 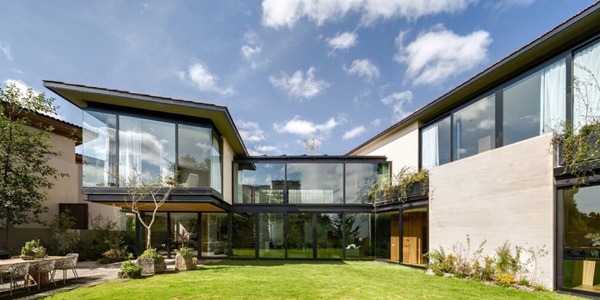 Today we will share to you a house that is best design and surrounded by this astounding garden. This house is spotted in Mexico City. This house is actually built on a fan-shaped with an area of 800 square meter and opened to the northeast. According to the designer, after the volumetric studies, they have decided to have an H-scheme layout of the house. 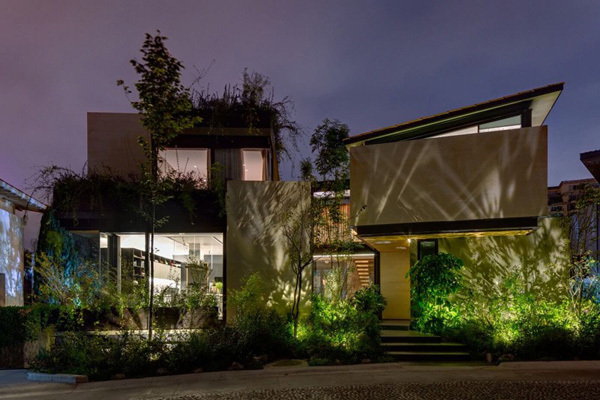 With that layout, the sustainable light and fresh air is free to access the different parts of the house. Let us see more of the amazing areas of the house through the images below. 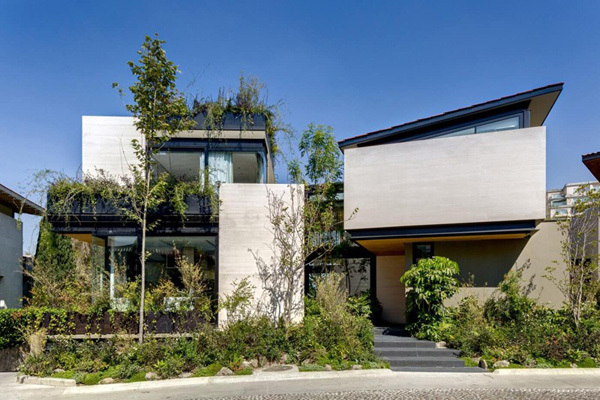 Surrounded by these plants and tall trees, the geometric figure and volume of this house is still stand out. 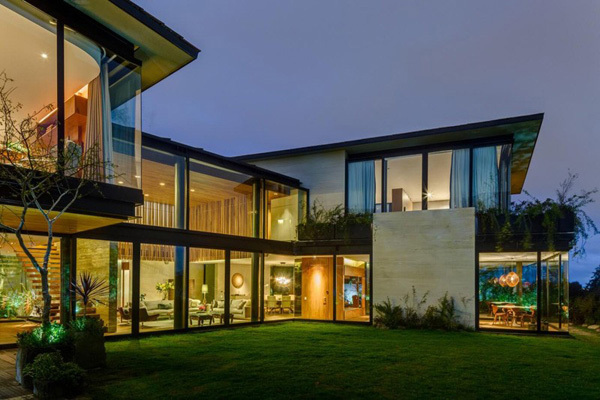 AFlawlessly and neat effect of the glassed walls in this house is spotted in the second level of the building. Who will not say that this area is one of the best spot in the house? The lines and patterns exclusively display in the second level of the house also jives with the wooden materials and furniture in the sala. 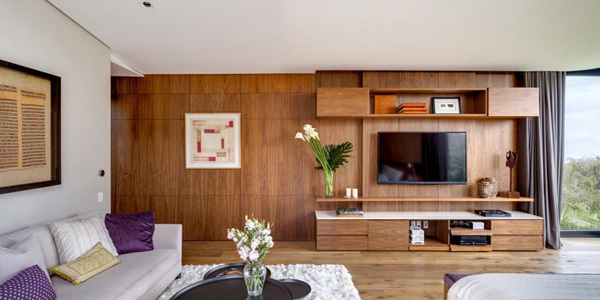 Purple chairs set in this brown and grey themed interior enhances the design and style of this living space. 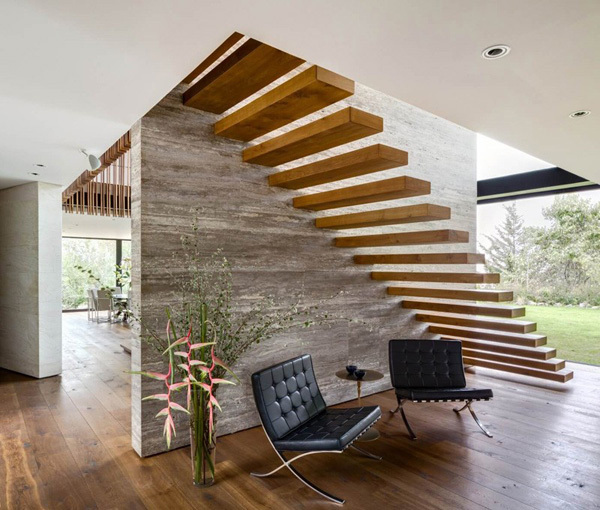 Look at the modern and unique design of this wooden staircase that also highlighted its contemporary design. 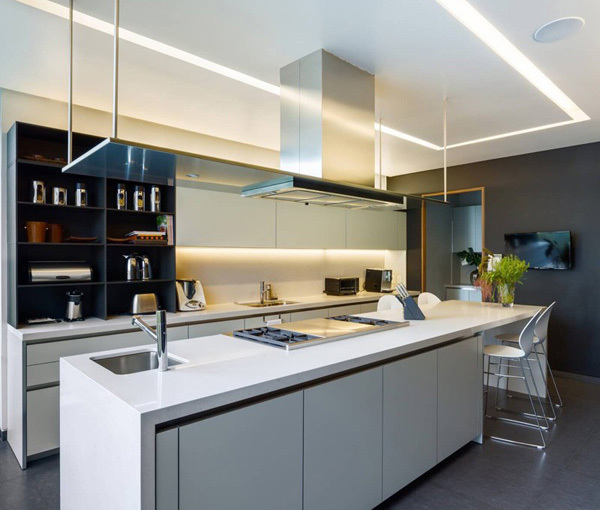 The lighting system employ in the kitchen can undeniably expose its modern and elegant style. Here’s the trendy and functional design of dining set that also jives with the extraordinary chandelier above it. Here’s the modern and spacious bedroom that offers the best comfort and stylish furniture. At the other side of the bedroom, is a living space where his guest can comfortably sit down and watch their favorite film, too. 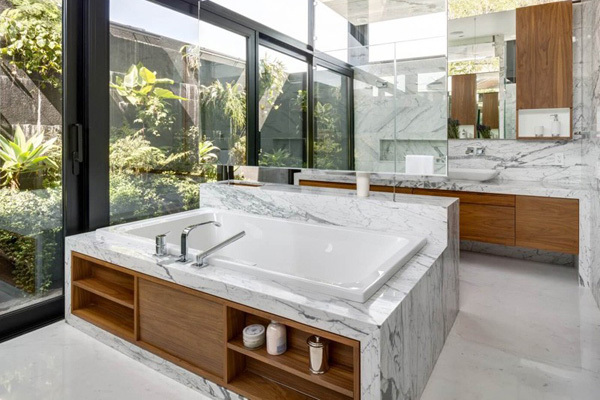 Mosaic tiled floors and walls in this bathroom also complements with the glassed walls and white fixtures. 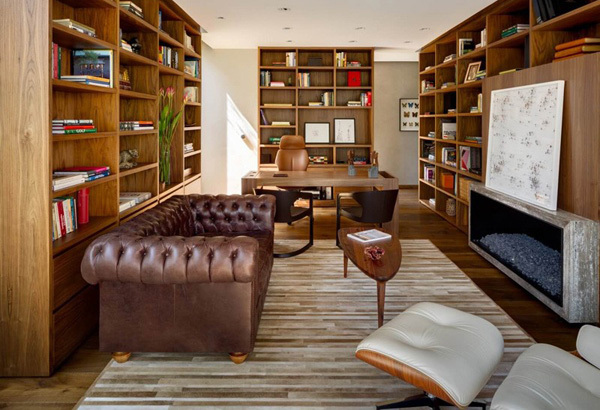 Here’s the brown sofa that perfectly match with the shelves and office table in this study room in the house. At night, the LED lights installed all over the interior may undeniably display the elegance and luxury. 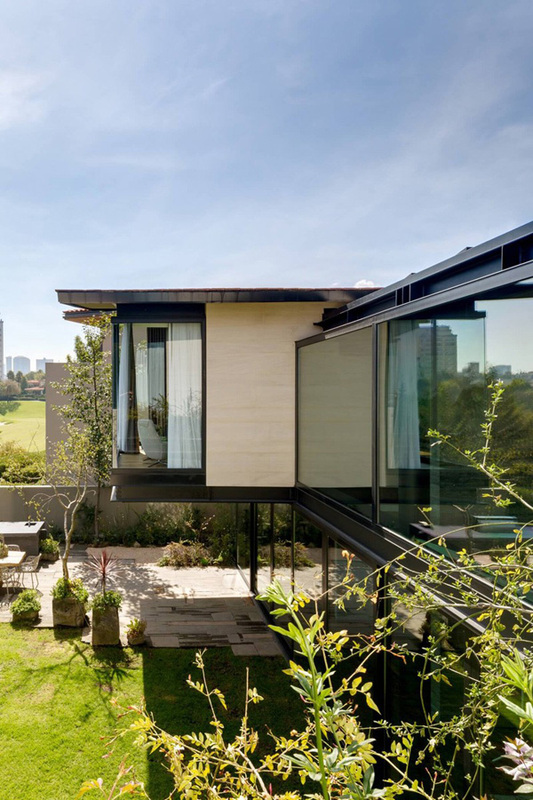 Exceptional views may be offer from the garden as it can transparently viewed the the different areas of the interior. In the entrance, the lighting system adds elegance and charm in every parts of this exterior. 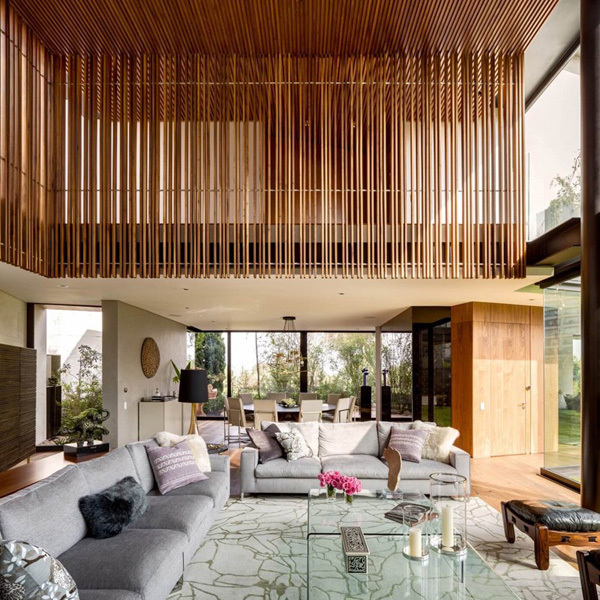 As we have seen the fabulous and comfortable spaces in the house, we can say that both interiors and exteriors have unveiled the great style and design of each corner of the house. We may found our very own favourite spaces in this house. But I am very fascinated with how the VGZ Architecture presented the remarkable rich and relaxing space in the garden. Certainly this house surrounded by garden will provide the ambiance that we are looking for in a house. We hope that you may also choose to apply these features in your house in the future.